I'm a bit of a sucker for creamy pasta dishes - and wanted something I could stir together quickly that still felt kind of summery. And here it is. The peas are sweet and cooked straight from the freezer. The mascarpone (a whole tub is used here, to avoid waste) is creamy but somehow still light, and the spinach adds colour and flavour, roughly chopped and stirred into the sauce. You only need to finish it with a grating of Grana Padano and it's on the table in around 10 minutes. Put a large pan of water on to boil and add in a good pinch of salt. When it's boiling, add the spaghetti. While that's cooking, heat the olive oil in a medium-sized frying pan and fry the garlic gently. Stir in the mascarpone and the spinach, and heat until the mascarpone has melted a little. Scatter in a handful of Grana Padano and stir well. Turn off the heat. When the spaghetti has just five minutes' cooking time left, tip the frozen peas into the saucepan with the pasta. 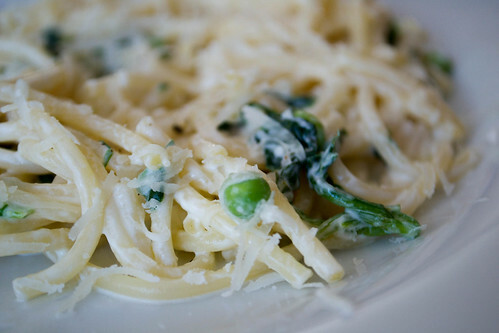 Once the peas and the spaghetti is tender, drain and toss in the mascarpone sauce. Taste, season with salt and pepper and then serve with more Grana Padano alongside.